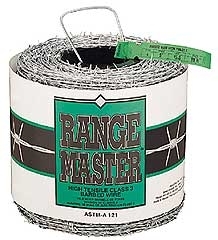 Range Master 4 point high tensile wire is 15.5 gauge, Class 3 galvanized, with 5 inch barb spacing. 80 rod roll or 1,320 feet. Motto 4-Point High Tensile 15.5 Gauge Barbed Wire has a breaking strength equal to standard 12.5g barbed wire, but is half the weight of standard barbed wire. 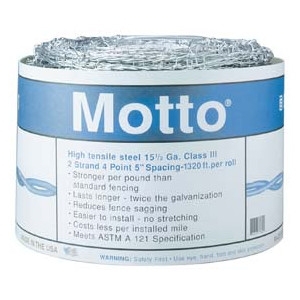 Motto is Class 3 galvanized for 2-3 times the life expectancy of Class 1 galvanization. The high tensile line wires used in Motto allow for increased post spacing. 5&quot; barb spacing.&nbsp; 1350 feet.